Book Review: Alex Kotlowitz's 'An American Summer' Presents Human Side Of Gun Violence In Chicago Alex Kotlowitz's new book amplifies the words of those who have witnessed tragedy and makes their experiences available to readers — a chronicle that is painful but also necessary. 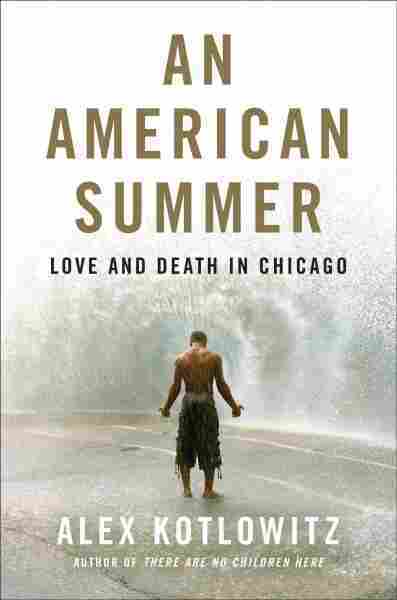 In An American Summer, the reader is asked to ponder this: "In a good year in Chicago, roughly 2,000 people get wounded by gun fire, or five people a day, give or take. Some years the number has risen to over 4,000, or roughly one person every two hours." Writer and filmmaker Alex Kotlowitz knows this. He has written about Chicago for most of his career. His book There Are No Children Here, which chronicles the lives of two boys struggling to survive in Chicago's Henry Horner Homes public housing complex, was named one of the 150 most import important books of the 20th century by the New York Public Library. In An American Summer, his latest book, Kotlowitz revisits the brutal, blood-soaked streets of Chicago and digs into the lives of those touched by violence, both as victims and culprits. In the last two decades, he notes, 14,033 people have been killed and about 60,000 have been wounded by gunfire in Chicago. This level of violence stems from a combination of gang and drug activity, housing complexes that segregate less fortunate people from the more affluent parts of the city, and easy access to guns. However, while it is easy to identify the elements that create it, the impact of that gun violence spreads through society rhizomatically, affecting people and communities alike in a variety of ways. Kotlowitz spent the summer of 2013 researching how gun violence shapes the city. An American Summer is the result of that; a reporting mosaic that brings together the stories he encountered that summer. It is a painful chronicle about an extremely violent city based on the narratives of those who managed to survive its streets. The main characters in this book are diverse. There is a man who was a gang member for years and still struggles to cope with his actions; a mother who refuses to hate her son's killer and battles to make people understand individuals are more than their worst acts; a social worker dealing with a student who refuses to give information about the death of his best friend; and a reporter who lives, and tweets, the constant onslaught of shootings in Chicago. Some victims learn to move on and some turn into activists, thus breaking the cycle. Unfortunately, others are unable to let go. This last group contributes to perpetuating violence. What happens to them changes them for the worse. It becomes a wound that "festers; the desire for vengeance and payback burns until it eventually erupts." "Extra overtime so they can put more police on the streets. Using data to identify hot spots where they can send more police. Using algorithms to identify the four hundred young men they believe most likely to shoot someone or get shot." "In Chicago, the vast majority of murders and shootings go unsolved. Murder someone, and chances are only one in four that you'll get caught. Shoot someone and injure them, it's only a one in ten possibility that you'll get charged. That's not a misprint. You have an awfully good chance of shooting someone in the city and getting away with it." An American Summer isn't a classic research narrative. It doesn't have copious footnotes. It doesn't include a bibliography at the end. Instead, Kotlowitz presents the human side of tragedy, the stories of those left behind. He paints an honest picture of the constant tug-of-war between families, communities, and schools on one side and the streets on the other. He gives readers an unflinching look at the lives of grieving mothers — and of social workers with too much on their plates who work stuffed in windowless cinder-block rooms the size of walk-in closets, which Kotlowitz says is symbolic of "where social workers fit into the hierarchy of our schools." This makes An American Summer an uncomfortable read that cuts to the marrow of one of country's most violent cities and exposes the inequities, economic factors, and psycho-geographic elements that make it what it is. One of the worst things about Chicago's violence is that it is public, so "each shooting or its aftermath is witnessed by many, children and adults alike." With this book, Kotlowitz amplifies the words of those who have witnessed it and makes their experience available to readers. The experience is painful, but also tremendously necessary. There are no answers in these pages, but sometimes getting a good look at something is the first step in finding a solution.